You may have chosen to stay with us here at the October Country Inn because you’re looking for an authentic Vermont experience. What could be more authentic than staying at a Vermont farmhouse converted into a family owned and operated country inn? Well, you might want to dine at a Vermont, family owned and operated working farm as well. Farm-to-table dining has become an marketing ploy that is often quite a distance from the farm to the table. Not so at the Cloudland Farm. Located four miles up a dirt road near Woodstock, with the Appalachian Trail running through the property, Cloudland Farm offers dinner service by reservation most Fridays and Saturdays. This is true farm-to-table dining, the table is on the farm. Jake Webb plates fresh local greens. 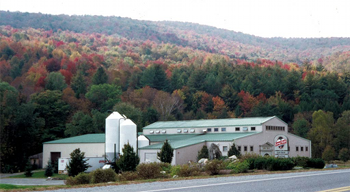 Cloudland Farm is a diversified working farm which has been in the Emmons family since 1908. The spectacular views on the four-mile drive up scenic Cloudland Road are part of the whole experience. At the farm, visitors are free to take photographs from the road of the farmland and any of the animals that may be in view. This may include black Angus cattle and calves, horses, laying hens, Cornish-cross meat chickens, turkeys, the barn cats or pigs. “Take a Hike,” and sip a cold, local craft-brew while lounging by the river. It’s an early spring this year at the October Country Inn. Winter didn’t offer much opportunity for snow travelers to enjoy what Vermont winter typically offers. But, despite disappointing conditions for snow related activities, travelers to the area could always depend on sitting down to a frosty pint of a local Long Trail craft-brew, and a hearty lunch at the nearby Long Trail Brew Pub. October Country Inn is strategically located in this regard. We are across the street from the Long Trail Brewery. No need to drive. Originally called Mountain Brewers, what is now the Long Trail Brewing Company started-up in the basement of the Bridgewater Woolen Mill in 1989. 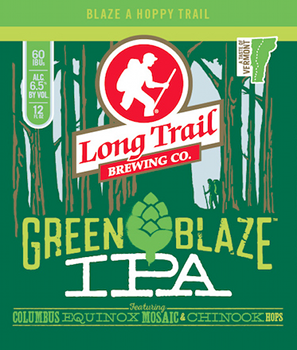 It changed its name to Long Trail Brewing Company in 1995 and relocated to its present location on the banks of the Ottaquechee River in the heart of the Green Mountains. Long Trail Ale, a German Altbier, is the company’s flagship beer. It is the largest selling craft-brew in Vermont. The Brown Bag concept was developed as a way for Long Trail’s brewers to develop new recipes quickly. These small batch brews have produced Long Trail favorites like Double Bag, a Strong Ale; and Hit the Trail Ale, a limited release English Brown Ale; an American IPA; Belgian Smoked Porter; Milk Stout; and Maple Maibock that is fermented with maple syrup. Sipping a cold frosty pint alongside the river at Long Trail’s Brew Pub. A paella-like Spanish rice to complement our Mexican dinner’s chicken enchiladas. Here at the October Country Inn, Mexican night is one of our favorite internationally themed dinners. Edie and I are both from southern California, and we dearly love living in the Woodstock and Killington area of Vermont, but we really miss the good Mexican food that is so readily available in southern California. So when we cook our Mexican meal for our guests, we always make sure there’s going to be plenty of leftovers for ourselves. Onion, green pepper, and tomato diced and ready to go. Saute the onions, green peppers, and garlic in the olive oil. To dice the tomatoes, slice off the top enough to expose the seeded core. Slice the tomato in half lengthwise. Scoop out the core and the seeds with a spoon. Dice the remaining meat and skin. Place the water in a pot and bring to a boil. Add everything to the pot and return to a boil. Cover the pot and simmer on low heat for about 20 minutes or until all of the free-standing water in the pot has been absorbed. Season and fluff and serve while hot. Ole! Grilled flank steak with roasted vegetables–a hearty meal for the Fall. Trimmed flank steak ready to go into the marinate. Trim the flank steak and marinate for at least 8 hours. For the marinate, combine 1 cup of olive oil with the soy sauce, garlic, Worcestershire sauce, Tabasco sauce, dry mustard, and black pepper and whisk until blended. Pour the marinate over the flank steak in a Pyrex casserole, cover, and set aside for about 3 hours, periodically sloshing the marinate over the beef in order to evenly coat it. After 3 hours, refrigerate until about 1 hour before grilling. Steamed vegetables spread out on a baking sheet and ready to go into the oven. Prepare the vegetables about 1 1/2 hours before grilling. In this case, we used 1 medium sweet potato, 2 medium Yukon gold potatoes, and 2 large carrots. Wash the sweet potatoe, and the Yukon gold potatoes, leave the skin on, and cut into bite sized chunks. Peel the carrots and also cut into bite sized chunks. Place the vegetable chunks into a basket steamer in a pot with boiling water. Cover and steam the vegetables for 5 minutes. Carefully remove the basket out of the steamer along with its steaming contents and dump the dry but steaming vegetables into a mixing bowl. Combine the remaining 1/4 cup of olive oil, the salt, rosemary, and cayenne pepper, blend well and pour over the steaming vegetables. Gently toss to evenly coat the vegetables with the olive oil mixture. When coated, empty the vegetables onto a baking sheet that has been coated with nonstick cooking spray and spread them out. Marinated flank steak on the grill. Place the vegetables in a 450 degree preheated oven, and take the marinated flank steak out of the refrigerator. Prepare and light the coals for the grill at this time. Turn and rotate the vegetables after about one-half hour. After the potatoes have been in the oven about 45 minutes, place the flank steak on the grill over an even bed of glowing coals. Grill for 10 to 15 minutes, turning once, depending on how you like it cooked. Check with a meat thermometer (130 rare, 145 medium rare, 160 well). Remove from the grill and slice diagonally against the grain. Remove the vegetables after about one hour. It all should have come together nicely, and you should be ready to eat. Fall is here and heirloom apples–America’s national fruit–abound. An heirloom apple is one that is grown from open pollination (pollinated by natural forces–bees, the wind) from a line of trees that have been in existence at least 100 years. New England in general, and Vermont in particular, is home to a great many such varieties. Now is the time of year when the harvest is in, and many small farms encourage visitors to pick their own, or sample an assortment of varities from their farmstand. The association of apples with romance, beauty, temptation, immortality, and sensuality is a theme in cultures all over the globe. In Norse, Icelandic, Babylonian, Celtic, and Roman myths, gods eat apples to preserve their immortality (an apple a day keeps the doctor away), suitors use apples to achieve a conquest, women conceive with the help of magical apples, and heroes fall from grace because they couldn’t resist the temptation of a perfect fruit. A local farmstand displays a selection of heirloom apples. The British puritans of the 16th and 17th centuries held fast to the virtues of thrift and self-sufficiency, so when they left England for America, they took apples with them. In 1629, Captain John Smith wrote that apples “prospered exceedingly” in Jamestown’s coastal climate. The first new American apple variety that emerged from a Boston orchard was called Blaxton’s Yellow Sweeting. For early colonists, apples weren’t just a sweet table fruit. They were the source of cider vinegar, which was used in preserving. They provided hard apple cider to drink, and from cider came distilled ciderjack, which was used as a spirit, a preservative, and an anesthetic. With American independence in 1776, the western migration began and apples traveled right along with the early settlers. In the early 1800’s, a young missionary named John Chapman left Massachusetts and headed west by canoe into the nascent territories of Pennsylvania, Ohio, West Virginia, Illinois, and Indiana to preach the Good Word and spread the gospel of apples. He planted trees everywhere he went, earning the nickname Johnny Appleseed. One of OCI’s 100-year-old apple trees. Here at the October Country Inn, heirloom apple trees dot the grounds. Two of our trees are at least 100 years old, and typically shower us with apples. What we or our neighbors and guests don’t use, the local deer and other wildlife do. About a month ago, a patch of fallen apples near the road had been sitting on the ground for a week or so when a young racoon showed up one afternoon to sample the freshly fermented fruit. It must have gotten a bit of a buzz because it ran around in circles, and rolled on the ground for a while, and then curled up for a snooze down by the barn. Heirloom apples seem to be a favorite with the local wildlife as well.